I love this layout as it reminds me so much of holidays long ago by the sea. 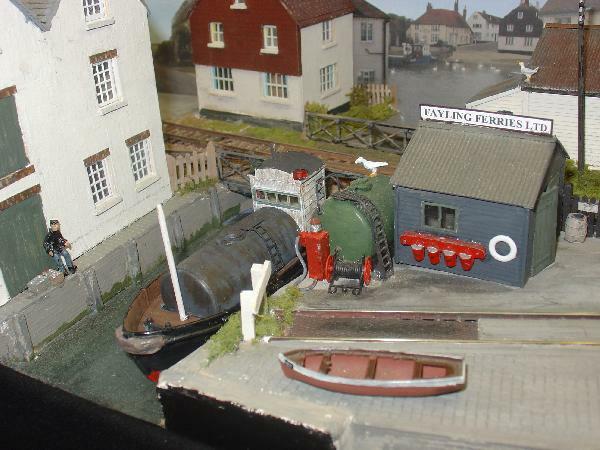 The oiler vessel was moored in the creek for a change, with the fishing boat unloading at the ferry quay. At times the station was empty, often while I was trying to work out why there was a short circuit on the ferry siding, when it has worked perfectly under test at home - maybe the heat was responsible; something to do with the micro-switch I suspect, but tinkering when there were few visitors (during the football) failed to find a definite cause. Loco no. 3 was on form and did much of the work during the day. 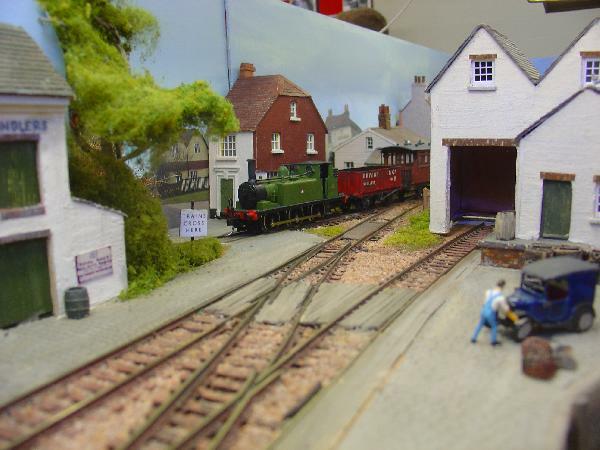 Following a number of near misses, road traffic is now warned about the level crossing. The little Dapol Pug, once warmed up (!) performed better in the afternoon, but went unrecorded. 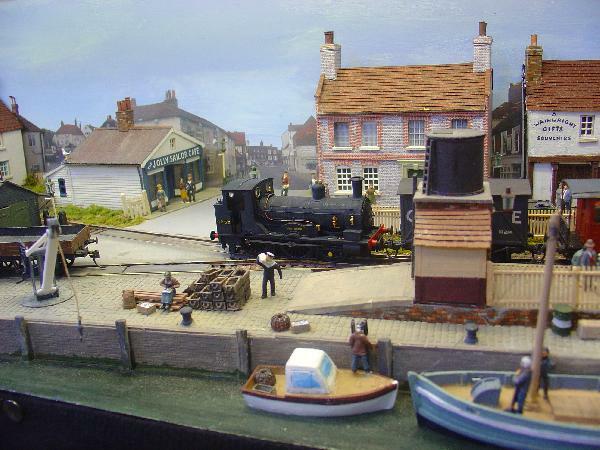 The company's Terrier was also on good form and is seen here bringing a cut of wagons from the commercial quay into the station. 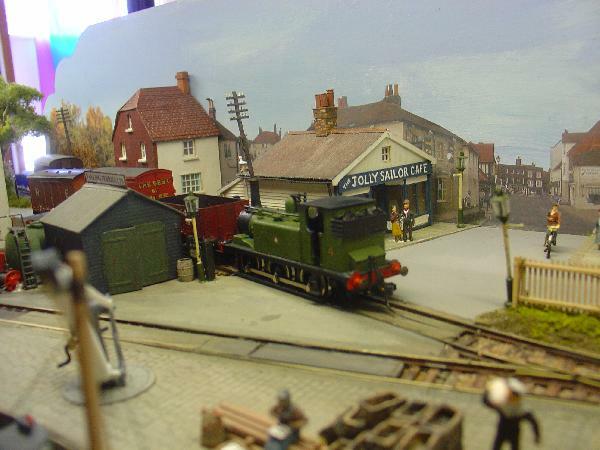 At 7pm the Beattie tank is seen leaving for the main line station with the last train of the day. Apart from the short circuit, a couple of other finishing-off jobs are apparent from these pictures, the most obvious one being the fish-packing building which is all too obviously an empty shell when seen from some angles. 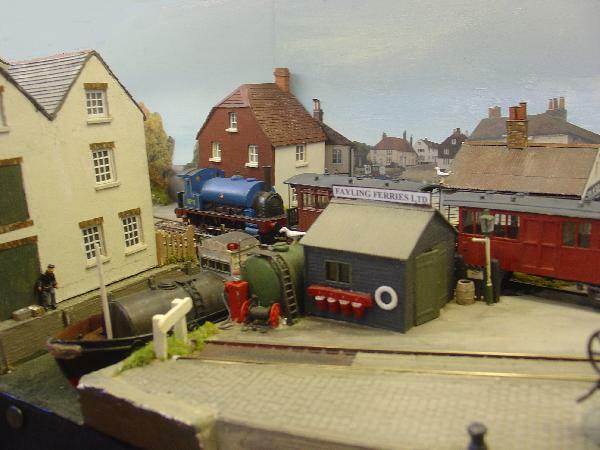 The other is the Beattie well tank which urgently needs Southern Railway markings. 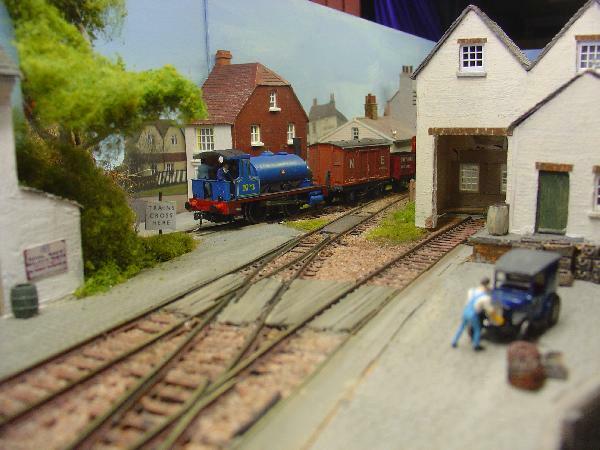 The layout's next outing is at Burgess Hill in September, so there should be enough time for the upgrade work. Not long to go until Shellsea's next show. The short circuit's cause turned out to be the micro-switch, as suspected. It had worked loose on its fitting screw and had moved just enough to stop the point-rod's throw from activating it properly. Now re-positioned and with an added screw to prevent further movement. 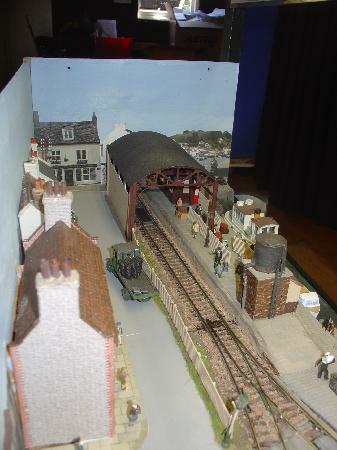 The interior of the fish-packing shed has been clad in brickwork with a loading platform on the side that cannot be seen by the public; it makes a bit of a nonsense of the front windows, which we assume is an office but is actually part of the loading bay to accommodate an extra wagon in the siding. Kadees fitted to the Royal Daylight tank wagon today, and a start made on re-badging the Beattie tank. I've rescued one of the last six of the class, three of which were sent to the Wenford branch and the others scrapped among which was 0257. Having used matt black on the cab side, I think a general repaint will eventually be necessary. 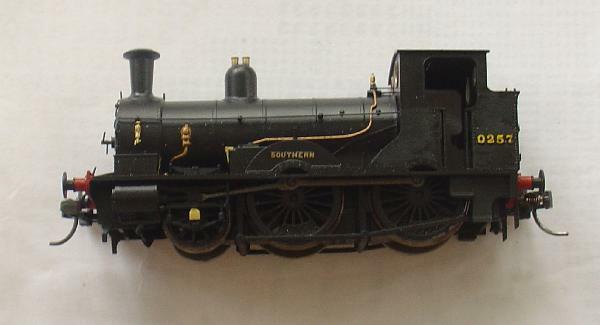 Finished the other side, and then thought that I might as well be hung for a sheep as a lamb and, as the loco is no longer "collectable", I might as well painted it matt black. When the paint dries, I'll think about a little light weathering. And have a look for some loco crew figures. 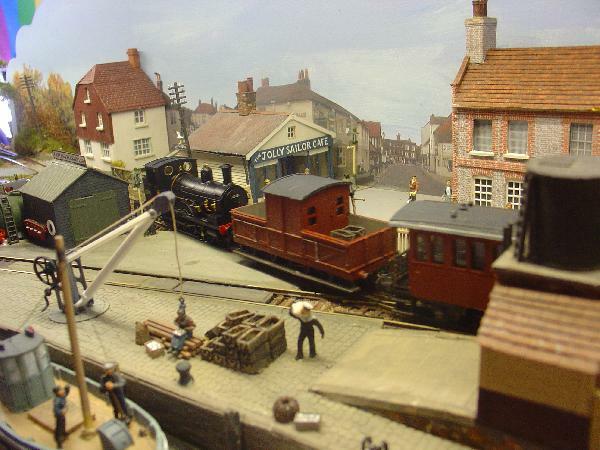 and a shot of the Tramway's Terrier leaving the harbour with a mixed train. 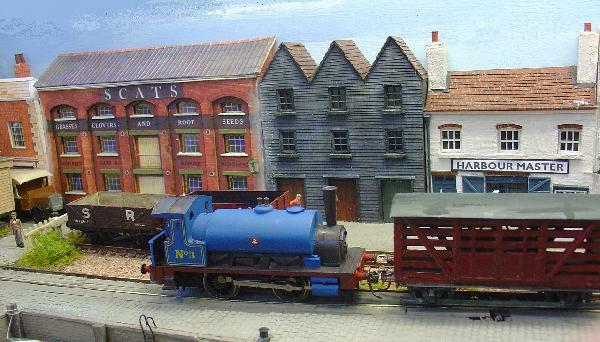 Loose coupled wagon between loco and coaches??? It's only a two mile run on the flat and the coaches have hand brakes (and it's sometimes really inconvenient/difficult to get the wagon at the back of the train). The "Can You See?" challenge was interesting. To answer the "Where can you buy Fish and Chips?" question, many pointed to the ships' chandlers. The answer, in the absence of a chip shop in Terminus Street, is the Jolly Sailor Café. Reminds me of summer holidays as a child. 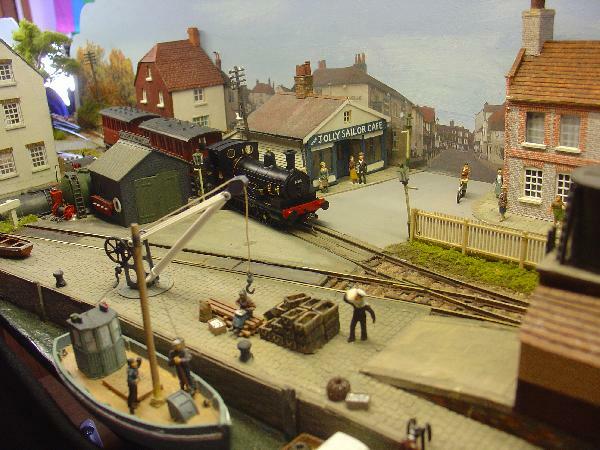 Work before the latest show involved finishing the interior of the fisheries building, visible here in a view of the same mixed train seen earlier. As the blocks carrying the baseboard hinges are also inside, there wasn't much room for a detailed interior but the walls are now clad with brick-paper and there is a suggestion that the external loading platform carries on inside. Two more shots from the recent show, both showing No 3. Looking at them I realise that the loco looks a bit bare, and there is quite a lot of detail still to add, including handrails and lamp irons for starters. I honestly think small details missing are not that noticeable at normal viewing distances Giles. The point is you know they are missing most members of the general public do not. 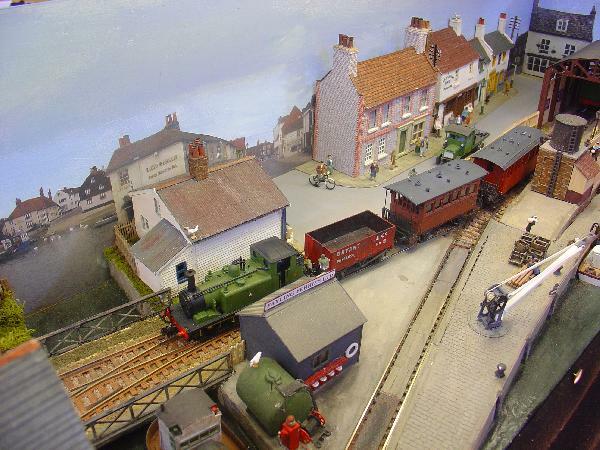 I think it's a lovely little layout and one of my favourites.